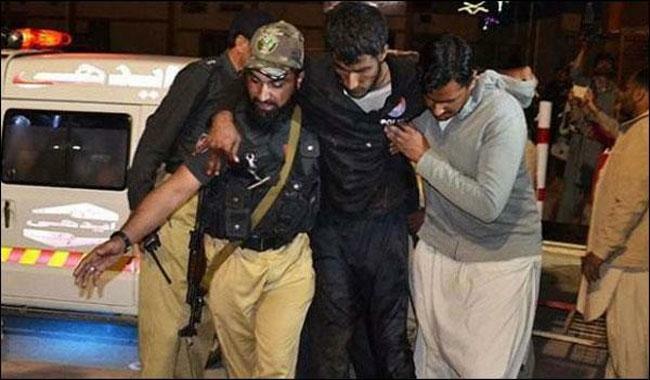 At least 16 people including six police officers were killed and over 80 others injured in a suicide explosion at a chairing cross outside Punjab Assembly, in the heart of Lahore on Monday evening when hundreds of chemists were protesting nearby against a new regulatory law. Jamaatul Ahrar (JA), a faction of Tehreek-e-Taliban Pakistan (TTP), has claimed responsibility for the attack. The group previously claimed responsibility for the March 2016 Easter bombing at Gulshan-e-Iqbal Park in Lahore, which killed over 70 people. Farooq demanded adequate financial and medical assistance to the victims. The AWP spokesperson criticized the law enforcement and security agencies for failing to protect the people as it was the second major terrorist attack in two months this year. Farooq said the security agencies have miserably failed to protect the people. Billions of rupees have already been spent on Zarb-e-Azb and 70,000 lives including young military and police officers have been lost in terrorist attacks. “The civil and military leadership every now and then claim that the backbone of the terrorists has been broken but they still strike wherever and whenever they want every month,” the AWP spokesperson questioned. He criticized the interior minister and the Punjab government for resisting action against some sectarian outfits in Punjab. Terrorism cannot be eliminated completely if action against the nurseries and safe sanctuaries of terrorists is not taken throughout the country, he said. Farooq said why the Rangers and police are quick enough to take action against peasants and working class people and hesitant to weed out terrorists. The strategy to combat terrorism needs to be changed. A vigilant eye should be kept on religious seminaries in Pakiatan and their syllabus should be changed. He demanded action against all proscribed terrorist and sectarian outfits across-the-board. He also demanded overhauling of Pakistan’s foreign and security policies. He criticized the provincial government for soft paddling on some extremist organizations which have links with terrorist outfits who are responsible for such dastardly acts.